It’s the end of January and my month of Scottish recipes so I thought I’d end on a sweet note with this traditional Almond Flory, the perfect Scottish bake that suits the wintery weather and goes perfectly with a cup of tea in front of a roaring fire.Don’t you just love this name? The word flory makes me think of something almost frivolous and fun. Can a tart be fun like that? Whoops, that sounds bad, maybe I should use the word pie there! Well I like to think so. Playing with flavours, mixing things up a bit. The spices, squishiness of fruit and comforting warmth of almond, yes to me that’s fun. 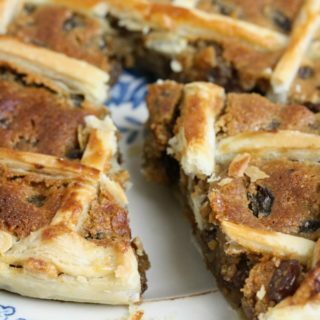 The Almond Flory is a sweet and fancy latticed tart that was very popular in Edinburgh’s finest tea rooms way back in history when tea rooms were considered the height of sophistication. Nowadays it’s fancy cocktail bars and eateries but a couple of centuries ago the tea room was the place to be. I wrote this recipe for Almond Flory for my book Simply Scottish Cakes & Bakes and I have stepped away from the traditional recipe by using a mixture of half fromage frais and half cream to try to cut down the fat content a little. To be honest while I did all the recipes and tried and tested everything again and again doing this damn book I put on so much weight it was unbelievable. I was very popular with my daughter and her classmates at the time as she’d take boxes of baked goodies into school almost every day to share out. Oh well even if my waistline suffered at least they enjoyed it. 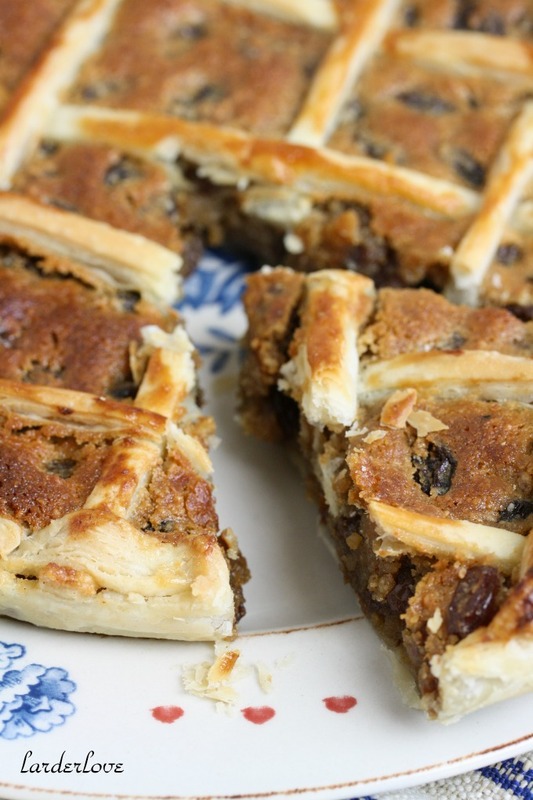 Like many Scottish tarts and cakes this recipe calls for dried fruit which has always been a staple in Scottish baking. Buy the best quality dried fruit you can find as cheaper stuff can often be a bit grainy and tasteless. You will be adding brandy which will boost the fruit in the baking. You will also be needing some spices, cinnamon and nutmeg and orange flower water, which you can buy in most supermarkets. You can make your own puff pastry if you have the time and patience, but to be honest I just use frozen puff pastry for my almond flory. The frozen stuff is so easy to use, handy to have in your freezer and tastes just as good as homemade if you buy good quality stuff. So here you’ll find my recipe for Almond Flory, go on get baking up a wee Scottish treat today. Almond Flory is a traditional Scottish tea time treat that is simple to make and tastes wonderful with a nive cup of tea. Roll out the pastry as thin as possible and press into the flan tin. 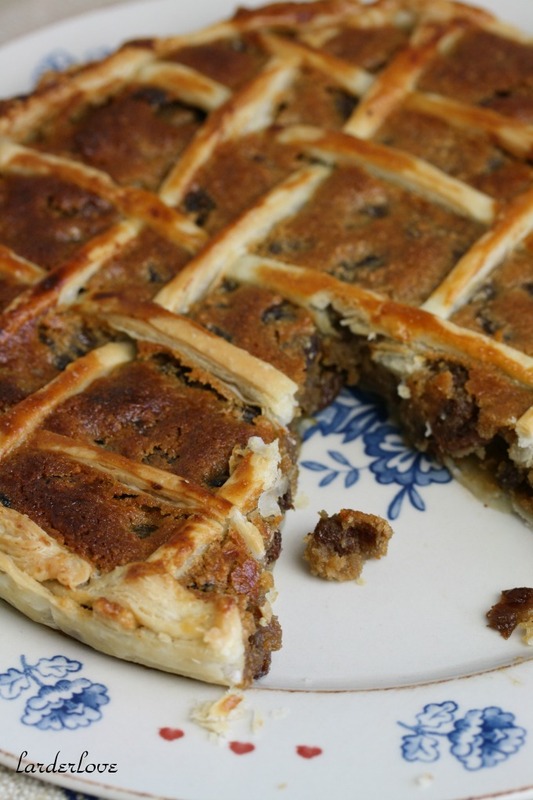 Reserve all the extra pastry for making the latticed top later. Bake for approximately 35 minutes or until golden. Remove from oven and sprinkle with a little sugar and allow to cool in tin for 10 minutes before removing and placing on a wire rack to cool completely. This sounds delicious! I love almondy sweet treats.